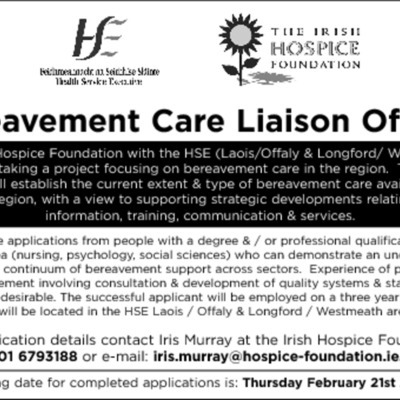 The Irish Hospice Foundation’s bereavement service established the Bereavement Care Liaison Officer Project in 2004. It was a initially developed as a partnership between the Irish Hospice Foundation and the HSE in the South East; Carlow, Kilkenny, Waterford, Wexford, South Tipperary (the formerly South-eastern Health Board) as a three year programme. 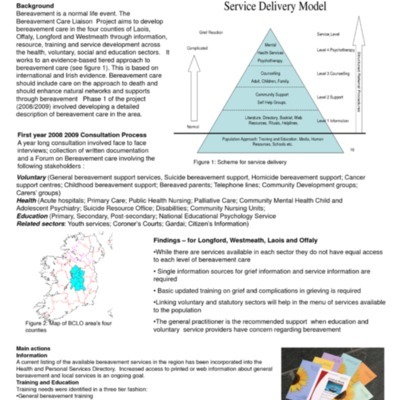 Phase one of the project involved describing bereavement care in the South East area, identifying training and support needs and developing a prioritised plan for the remaining two years of the project. 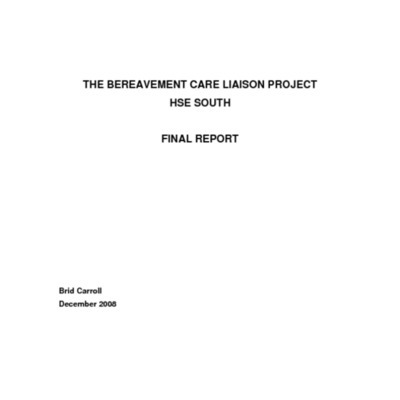 On completion of Phase One and the review of bereavement services a report titles ‘Investigation of the Gaps in Bereavement Care Services in the former HSE/SE region’ was published in 2005. In June 2008 first Bereavement Care Liaison Officer, Brid Carroll came into post. Brid Carroll was based in St. Patrick’s Hospital, Waterford and worked with the Suicide Resource Office and the HSE Palliative Care Services in the region. 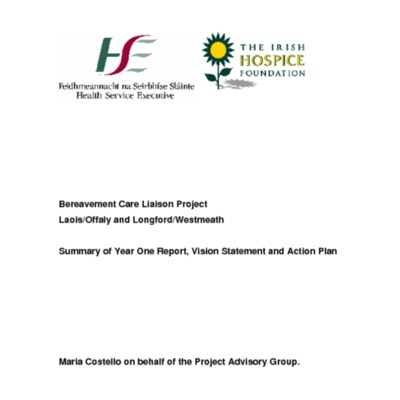 "Bereavement Care Liaison Project Laois/Offaly and Longford/Westmeath Summary of Year One Report, Vision Statement and Action Plan" Maria Costello on behalf of the Project Advisory Group. 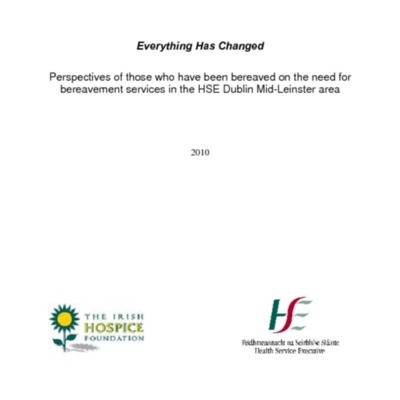 Everything Has Changed Perspectives of those who have been bereaved on the need for bereavement services in the HSE Dublin Mid-Leinster area. The Bereavement Care Liaison Project. Final Report.